A 17-year old terrorist climbed the security fence into the Adam community north of Jerusalem Thursday night, July 26, and slashed one victim after another. Yotam Ovadia, an Israeli man of 31, whom he repeatedly stabbed, died soon after from multiple wounds, a second man, aged 58, was badly hurt and a third though injured managed to pull his gun and shoot the killer dead. The terrorist came from the nearby Palestinian village of Kobar. He must have studied the electronic fence in advance, because he was able to climb over without triggering the sensors for an alarm. IDF forces were alerted and rushed to the scene with medics for treating the casualties. Magen Adom teams tried to resuscitate Yotam Ovadia, the first victim, before sending him to Hadassah hospital on Mount Scopus, where surgeons worked for hours to save his life, before pronouncing him dead. The other two victims were hospitalized and a member of the Adam community, a woman, was treated for shock. OC IDF Central Command Maj. Gen Nadav Padan and head of the Binyamin Brigade, Brig. Gen. Sharon Asman, reached the scene with the first troops. The location was combed for more terrorists in hiding. 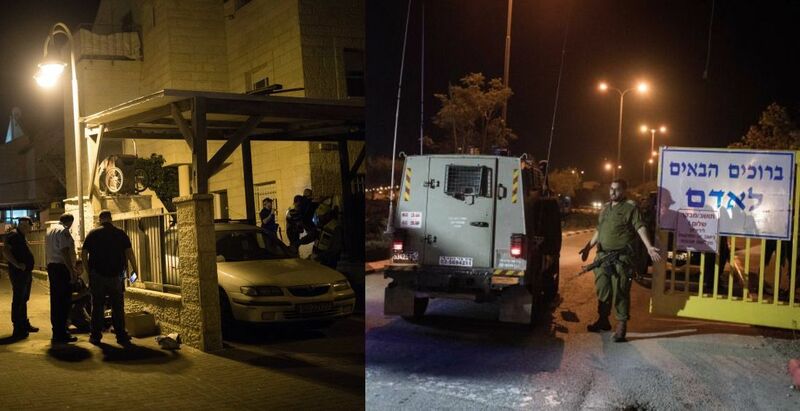 Members of the community were advised to stay indoors and shut their doors and windows while soldiers conducted house-to-house searches in neighboring communities of the Binyamin district. Kobar and additional Palestinian villages in the vicinity were placed under lockdown. One day the terrorists will go too far and Israel will take drastic action. The world will – as usual – blame Israel for defending itself. Once again, Palestinians choose to take Lives rather Live and Prosper in Peace with Israelis whose Religious Affiliation Population as of 2016 is 74.7% Jewish, 17.7% Muslim, 2.0% Christian, and 1.6% Druze, with the remaining 4.1% including both minor faiths such as Samaritanism and Baha’iism, and irreligious people with no faith. The history of the Israeli–Palestinian conflict began with the establishment of the State of Israel in 1948 from the Inter-Communal Violence between Israelis and Arabs from 1920 and erupted into full-scale hostilities in the 1947–48 Civil War. Today, the status of Jerusalem remains one of the core issues in the Israeli–Palestinian conflict. During the 1948 Arab–Israeli War, West Jerusalem was among the areas captured and later annexed by Israel while East Jerusalem, including the Old City, was captured and later annexed by Jordan. The name of God used most often in the Hebrew Bible is the Tetragrammaton (YHWH Hebrew: יהוה‎). Jews traditionally do not pronounce it, and instead refer to God as HaShem, literally “the Name”. In prayer the Tetragrammaton is substituted with the pronunciation Adonai, meaning “My Master”. Allah is the Arabic word referring to God in Abrahamic religions. It is distinguished from ilāh (Arabic: إله‎), the Arabic word meaning deity, which could refer to any of the gods worshipped in pre-Islamic Arabia. Gaza is full of vipers, but UN is full of cobras and hyenas. United Nations body has rejected an Israeli text that called on Hamas to release Israeli captives and the bodies of IDF soldiers held in Gaza. Allah: Originally a Hebrew word (alah) meaning “curse”. So all of islam worships a curse. Hamas: A Hebrew word meaning “violence”. Not coincidences. If you don’t believe me, Google it. Yes Mr Grey but time is coming where no one will care as all of us will be too busy trying to save our own skins. I can imagine that one day there will be an attack that claims many lives and motivates the-powers-that-be to take decisive action. By “decisive”, I mean action which will put a permanent stop to the incessant rocket fire, stabbings, kidnappings, vehicle attacks, kites, balloons and snipings. Suppose a rocket managed to hit a school full of children. Of course the fake “palestinians” would celebrate but surely such an atrocity would initiate a response which would permanently remove Hamas and Islamic Jihad from existence? I’d like to see this action before the atrocity takes place. I think an invasion of Gaza with a house-to-house search is completely justified by now, followed by a forced evacuation of Gaza residents to Jordan and Syria. Then if (when) similar attacks begin from East Jerusalem and the West Bank, do the same there. Demolish the mosques and the Dome of the Rock and build the Temple! Israel is now officially a Jewish State. Every State has the right to protect itself by whatever means necessary. This never happened….another hoax by the hoaxers…..lol…..
Palestinians do not know what they are fighting for. If they had their own state tomorrow they would starve. The only thing they produce in any quantity is hatred. Reliant upon handouts, they need to perpetually play the victim in the hope of financial support from the hoodwinked. Thankfully, I think the world is waking up to them. The Dichotomy seen in a Hopeless Hateful Palestinian 17 Year Youth choosing to Maim and Murder Israeli’s that chose Education to Live better Lives is evidence of why Palestinians are still being used as Pawns by Fatah and Hamas Servants of Iran Shiia Leaders. In a region where almost 65% of the population is under the age of 30, long term prosperity and stability hinges on the opportunities afforded to this generation. These Nation have seen the Opportunities for their Youth to be involved in Accelerating Technological-Industrial Urbanization as seen in Europe in 1800, America 1900s, and Asian Tigers of 2000 rise to Economic Power. Today, they are practicing and planning Global Market-Oriented Reforms to promote Youthful Businesses, Luxury Services and International Brands across the region. These Nations are Qatar, Kuwait, Saudi Arabia, Israel, Jordan, Egypt, Oman, Bahrain, Cyprus, United Arab Emirates and the 25-35 Millions Kurd’s in Iraq, Turkey, Armenia, Iran, and Syria that will surely make Kurdistan a Nation within 10 Years. short demographic window of opportunity for their youth confusion of educational exclusions. These Nations are Turkey, Libya, Sudan, Ethiopia, Morocco, Tunisia, Algeria, and the Lebanese Sunni, Shiia, Maronite, Eastern Orthodox, Armenia, Assyrians Christians and Druze Cultures that will determine these Nations Youth Futures. The Nations rthat efuse to employ, educate and promote inclusion, greater equality, and quality of life, that are the foundation for New Social Contracts with Young Generations. They prefer to rely upon depriving their own youth of opportunities so they can lead by preaching to their Young to Bleed and Die so they can Live in Luxury while staying in Power and Blaming others will never advance these Nations. These Nations are Iran, Iraq, Syria, Yemen, Somalia, Chad and the Palestinians of West Bank with 49% and Gaza 79% Living in Poverty as Hamas and Fatah use Palestinian Youth as Pawns for Death for Iran’s Shiia Power to Live in Luxury. Only when a Nation’s Leaders decides the Pathway of Planning Refreshing Models for their Youth learning to be Forward-Thinking focus on becoming showcases of investments in visible infrastructure with the development of the Invisible Infrastructure of Educational Institutions, Cultural Incentives and Signals that govern the Lives of People while refraining from providing the purposeless process of death and suicide. Thus, these societal infrastructural changes have the potential for remarkable transformation that goes far beyond bricks and mortar, but signal clear changes in the attitudes towards their youth with incentives to change their behaviors and perceptions accordingly. Like the handouts you get every year from your host the US…..or maybe the free subs from Germany through blackmail…..lovely bunch of people you are indeed…. What is needed is for all the major Islamic leaders and Imams and Mullahs to renounce the antisemitism which is a major part of Islam. That will never happen because to them Islam is perfect and all the hate with it. Muslims must be completely separated and moved far away from the Christians, Jews and all other “infidels” they hate but that too is an impossibility because they puposely move into our communities in an attempt to take over after they pretend that to be good peaceful people who are always the victim whom we must accommodate. Leftists don’t get it and never will until they are at war in the steeets. White European FAKE Hebrews can cry all they want, but the government getting 10 million dollars a day in welfare checks to KILL SEMITIC PEOPLE are the real anti-semites. Yes, cut off the money supply if you want to stop the killing. If the Terrorstinains were actually starving people subject to genocide (as they and the leftist creeps portray in ridiculously childish propaganda) rather than the truth which is that they are perpetual, well-off welfare recipients who scheme along with the EU and UN to kill Jews, overtake Israel and constantly increase their coffers and international supports in order to finance the jihad, then they would not be going around like murders on crack following murderous beliefs. Gotta respect the guy’s bravery. Certainly this is much more dignified than using US welfare checks to go on a shopping spree, for the purposes of baby killing from 35,000 feet. 10 million dollars a day buys a lot of killing. Medics and kite-flyers, look out! There is only one response to terrorists - end their reign of jihadist terror before they get us. I do not respect anything about the Islamst terrorist barbarians. Why do you say the we” gotta respcet the guy’s bravery”? I’m sick and tired to hear of Palestinian terror attacks since decades going back in time to Munich ’72 olympics? I remember the Palestinians crimes at Munich Olympics, a savage mass murder, they spilled blood on the Olympics symbol. Since thousands of years Olympics was the time to pause all war and hate, and go for pure sport and challenge. The Palestinians have tarnished it. They poison our every day with news of destruction and more hate since over 25 thousand days! Burn in Hell Palestinian people! Your way of life is wrong, you are thirsty of blood, you focus only destruction and death, you are more than barbaric! A Pal-e-SWINIAN also murdered US Senator Robert F. Kennedy. The “100 km limit” negotiated with Putin was in fact for the Palestinians, all the rest is cover up for the design of the Pace Deal. When the allegiances will switch, and until Syria rebuilds, Russians are to take ensure air cover protection for East Syria and in principal Damascus against Hezzbollah, and Israelis of the same for the North of Jordan. The fences should be electrified. Fry any terrorist who tries to cross into Israel and harm civilians. Looks like Iran can make the Gaza strip attack on large scale and the West Bank on a smaller scale. Retaliation – 1:10. For every Israeli killed, 10 dead terrorists. It is very funny that Canadian TVs does not report this Palestinian terrors. On Canada Trudeau thinks they are wonderful and has opened the doors wide. It does not fit the TRUDEAU Canadian “narrative” that Muslims can do no wrong, are victims, need to be invited in great numbers to replace Conservative voters and that they are the owners of all of the Middle East and anywhere a group of them have ever gathered in the past is theirs forever. What is really needed is to re-strengthen the ties between Israel and the American Jewish communities. While Israel enjoys the executive branch today, the future is unknown. The Jewish communities had excellent relations with congress, but that relationship has been on ice as of late. Work on the youth, they are walking away from religion and from Israel the only democracy in the region. These ties must not weaken!! Unity Unity is the key. One more thing, A trend has been gripping US universities whereby arab and liberal naturalized foreigners have been poisoning students minds. This dangerous phenomenon needs to be addressed and stopped. Many Jewish non-profit groups and individual donors continue to help universities that foster left wing ideologies and have brainwashed their students to openly speak against Israel. A higher level of effort and coordination need to be put in place to change that tied and reclaim positions on American campuses. Encourage Israeli students to come to the US for higher educetion and someone needs to lobby American Jewish $$ for scholarships. There are many weak politicians and media types who embrace stupidity. I will give you some names to ponder: Soros, Blumenthal, Schiff, Sanders, Rosenstein, Blitzer, Schumer, etc. The leftiats are not doing good by their actions. There are many more like Brenner, Merkel, Macron, etc., who are part of that same mindset that allow terrorism to happen through their propaganda and weakness. They blind themselves to reality and make Trump the scapegoat and diversion when they are the ones who have colluded and polluted the world with lies. Prophet Muhammad had schizophrenia. I can proof it. Talal_of_Jordan who was a descendant of muhammad had a severe schizophrenia. All Prophets had schizophrenia. Sympathy love and support, Palestine. From Canada.